We are a step back in time to the way things used to be. When you enter our gate, you will feel like you are back in the 1950â€™s. Located on mile marker 57.5 of sleepy Grassy Key, home of the original dolphin "Flipper". We have two docks, one 300 feet long and the other 100 feet stretching out into the beautiful Atlantic Ocean. The hawkâ€™s back reef provides calm swimming and boating water. Enjoy our complementary kayaks. Experience spectacular views from our tiki hut. All of our rooms are just a few feet away from our white sand beach. 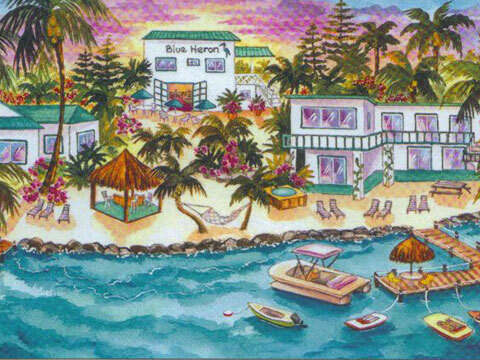 Fix yourself a cocktail and stroll down to one of our tiki huts or just hang out in a beach chair. Experience the cool breezes while napping in one of our hammocks. The world famous Dolphin Research Center is just a little over a mile away. You can actually swim with these truly amazing creatures. Try the unique experience of casting for bonefish on our own Bonefish flats. Scuba diving and snorkel charter boats are just minutes away, as well as a public golf course and shopping. Key West is just a short 57 miles away. It is truly a beautiful drive over the historic bridges.